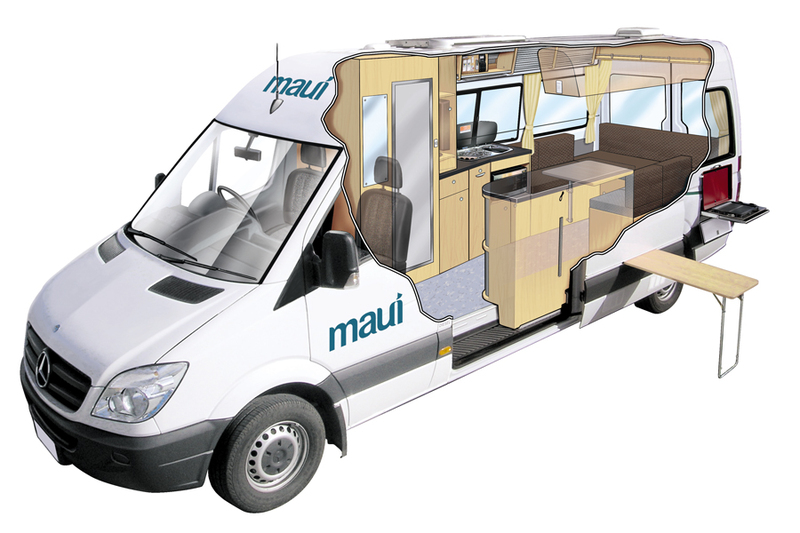 Maui is an experienced and trusted motorhome hire and car rental brand and have delivered great self-drive holidays for more than 25 years. Maui are focused on a continual quest for design enhancement and innovation to ensure travellers, just like you, experience the very best in campervan holidays with stylish interiors and spacious design. King size bed or two singles you choose! Apartment style kitchen equipment: china plates, bowls, cups, cutlery, wine glasses, drinking glasses, coffee plunger, bottle/can opener, colander, mixing bowls, saucepans, frying pans, chopping board, electric jug, gas kettle, tea towel, toaster. Freshly laundered linen: pillows, pillowcases, duvets (doona), sheets, towels. Everyday essentials: pegs, dustpan/brush, clothes hangers, fire extinguisher, bucket & hose, broom, matches, biodegradable toilet chemicals, dishwashing detergent, disposable gloves, bin liner & toilet roll. Convertible Child Seat: Recommended for infants 0-3 years old NZ$36 per rental. Booster Seat: Suitable for children between the ages of 3 and 8 years NZ$36 per rental. Camping Table & Chairs: Fully portable picnic tables & chairs are available, NZ$25 per table and NZ$18 per chair rental. Convertible Child Seat (3 years and under) or Booster seats (minimum 4 years of age) can only be legally fitted in the forward facing dinette seats in the vehicle. All children under the age of seven must be properly restrained by an approved child restrain. 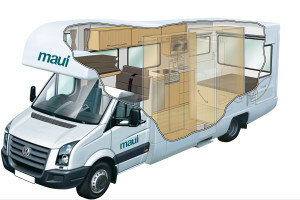 Not all Maui vehicles can accommodate all types of child restraint equipment. Your daily rental rates include standard protection, where you leave a NZ$7500 bond, which will be debited from your credit card. This amount is held as your excess. For this reason it is important that your credit card has sufficient funds available so as not to exceed your withdrawal allowance. The excess is reduced to nil. A security deposit of NZ$250 is recorded as an imprint against your credit card when the vehicle is collected. 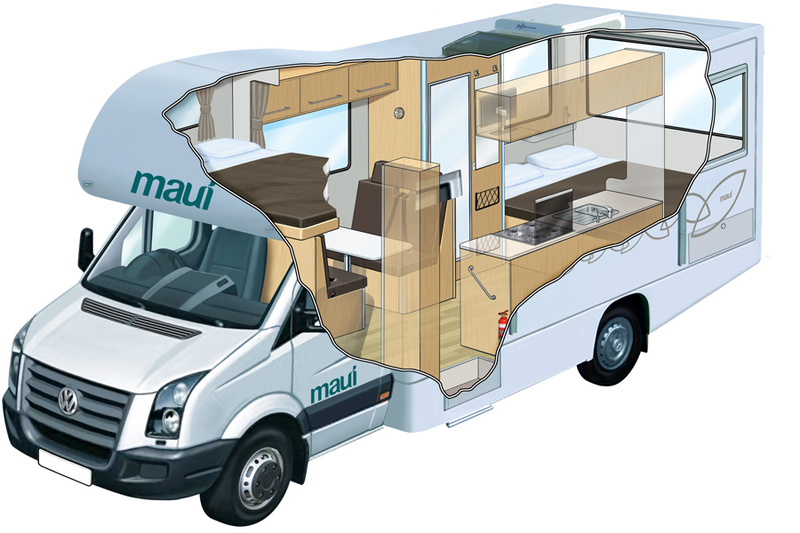 Liability Reduction Option is included in the Maui Premium Pack. The Road User Charge Recovery fee is included in the Maui Premium pack. If the premium pack has not been selected the Road User Charge Recovery Fee will be calculated and collected on return of the vehicle based on the kilometers travelled during the hire. Allows the customer to return the vehicle without the need for the gas bottle to be replenished. The gas bottle is used to operate the gas stove and to heat the hot water in vehicles with a hot water facility. This option can be purchased separately if the premium pack has not been selected.